An irritable sensation, craving for fluid, a need, a desire, a pleasure… !! They are some wines made to be famous, to be a land mark for a wine region, to rise to be a monument of wine-making; reaching to the stars and prices shooting to the moon. And some, completely forgotten and ignored when their names are pronounced or just remembered by the goose bumps they did gave you while tasted. Muscadet is one of the best example you can find in France. Ask someone in your entourage what the word “Muscadet” evokes to them. You might see their faces getting a funny expression of disgust while hearing the classic answers: “Muscadet?”, don’t like it”, “to sweet for me”. As of course everybody knows Muscadet is the synonym of Muscat (more often found as dry version, than sweet), reporting to Muscat VDN which you will find in south of France. I have to admit that Muscadet never gets the top place, while people choosing a wine. Most of the time when they come to a wine shop and ask straight away for a Muscadet, it’s for either “ court-bouillon”(fish stock) or Beurre Nantais (butter sauce made with Muscadet wine) or they are just looking for a dry cheap white wine..!!!! Far from this idea, Muscadet de Sevre et Maine and Muscadet de Sevre et Maine sur lie ( the difference in between the two, the second must stay on “lie” (fermenting yeast) one year before bottling) are a good examples of the raising quality of this 100% Melon de Bourgogne ( Gros plant) wine. The appellation Muscadet de Sevre et Maine is part of occidental Loire Valley wine region, located south of the town of Nantes in Loire Atlantique, on the larger AOP Muscadet. This AOP covers more than 13 000 ha, split in 5 sub-region AOP, Muscadet, Musacdet de Sèvre et Maine, Muscadet de Sèvre et Maine sur Lie, Muscadet « Côtes de grandlieu », Muscadet « Coteaux de la Loire ». The wines are usually dry, sometimes with a bit of fizziness for the one from “lie”, on floral aromas. This huge appellation is a mosaic of soils, from the North-East Ordovician-Carboniferous, to the South-East Metamorphic hercynian. Precambrian forming Grand-Lieu lake pit. The rest is mix of gneiss, sandy soil, clay, volcanic pebbles, and limestone. All the AOP enjoy a good drainage of the soils, which is necessary in this humid region of Pays Nantais. Almost all the region enjoys a warm climate due to the ocean influence eased by the Loire estuary, with few heat waves during the summer period. Un petit verre de Muscadet, s’il vous plait..!! I always enjoyed a good glass of Muscadet during spring time. Dry and crisp, it’s so pleasant to sip a glass of this wine on the terrace, when the days are getting warmer with wandering thoughts and just watching people passing by. It’s matching so well the spring vegetables as asparagus and green beans, cod and pesto, new garlic based dishes and off course it’s a classic match with oysters. While with a bit of age, 4 to 6 years it will accompany so well some noble fish as turbot or monkfish, as well as meat (I’m thinking about milk feed veal with sage butter). A wine of Comptoir (understand Bar), a wine for Philosopher (as every wine), a easy drinking wine in-between friends in a local French bar (if you living near Nantes), the kind of wine you are drinking while reinventing the wheel. A pouring down wine..!!! All this talk harms so badly the reputation of Muscadet. We do find some pretty good Muscadet in-between the range Musacet de Sevre et Maine et Musacdet de Sevre et Miane sur lie and we can find some communal crus at the same price as good Chablis or Burgundy crus. It found its fame all around the world and it found its place on the wine lists of the best restaurants. The image of “vin de comptoir” has faded away since a long time now..!! Jo Landron owns two domains « Le Château de la Carizière and Domaine de la Louveterie, both of them situated in the hamlet of « Haye Fouassière, both producing Muscadet. Spread on 46 ha, the entire vineyard is run in organic farming. It is very important to Jo Landron to keep the typicality of the wine, to express the climate of each plot and to bring out the nature of each soils. Amphibolite is a metamorphic rock formed during the erasing of the sea, a deteriorating greenstone bringing a high minerality to the wine due to hard work on tillage. A good open nose, flowery, feels like a spring day, hyacinth blossom, citrus, grassy, daffodil, hint of saltiness from the minerality, the nose evolves in complexity while opening. A frank attack, dry zingy, very good floral aromas, hint of spices, citrus acidity. The wine is fresh and very pleasant, the kind of wine that puts your palate back at the right place, a good acidity, that bring a good mineralty with long iodized length… a pure pleasure to drink now in a sunny spring day. 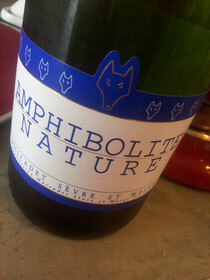 Amphibolite Nature is classified as Musacdet de Sèvre et Maine because the bottling is made in February and not in march as the decree authorized it for the “lie” AOP. This cuvée is made at “La Louveterie” where for me, the best wines from Jo Landron are coming from, just as “Les fiefs du Breil”. Good post. I learn something totally new and challenging on websites I stumbleupon everyday. It's always helpful to read through articles from other writers and practice a little something from their websites.